Joomla Virtuemart Template – LightMart has been updated. After long working hours, LightMart v2.0 (the big update!) is ready to be launched. In this new release, we mainly focused on fixing the compatibility issues between LightMart and the new version of Virtuemart (VM2.6). But, fixing the bugs can’t be enough to release a new update, you guys all know that. We have made also spectacular improvements to LightMart. 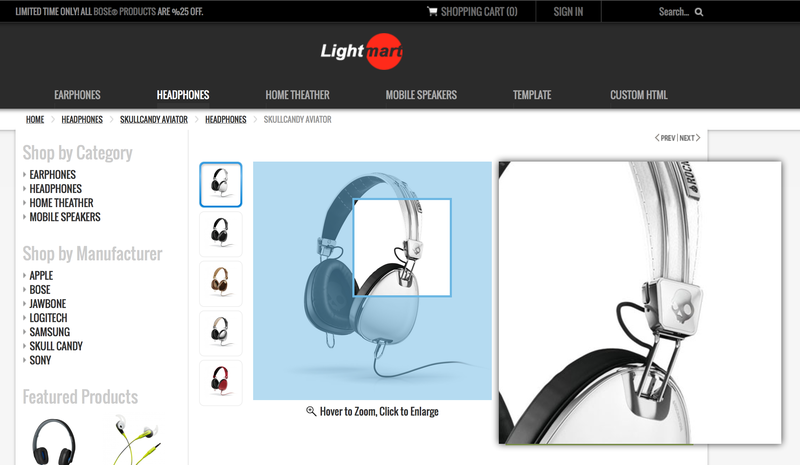 The LightMart has become stronger, powerful, user-friendly and mobile-friendly. Most important news is; we have implemented the Flexible Zoom Effect v4 to LightMart (normally it is sold for 30USD as a standalone extension), with the help of Flexible Zoom Effect v4, over 40 extra parameters have been added to Flexible VM2 Template Plugin (which lets you easily customize Virtuemart pages through backend). Flexible Zoom Effect v4 has been integrated to LightMart. Normally sold standalone for 30 USD. Facebox Modal Popup has been replaced by Fancybox v2. It gives much better performance. Category Browse Page – if the E or A type custom field is used, the add to cart button will be replaced with Choose Product Variant First button. Product Pages are re-organized, the UI improvements have been made. On the add to cart modal notification popup, UI improvements have been made. One of the most desirable requests: It is now possible to put reCaptcha below the Ask a Question form to avoid spamming. Shopping Cart Module has been improved. The LOADING icon appears when the DELETE icon is clicked.